Mr. Antonio Da Ros (1936-2012) graduated in 1957 from the Istituto Superiore di Arti Decorative ‘Carmini’ in Venice, getting the title of Professor in Decorative Arts and Architecture. 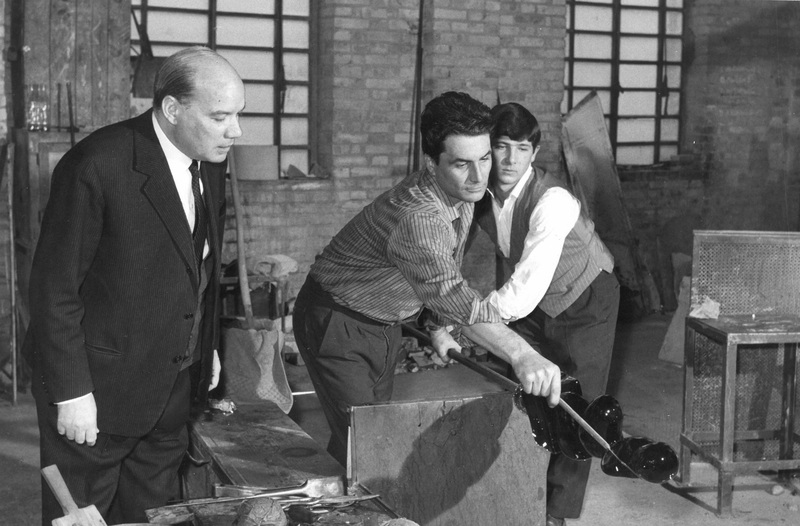 mIn 1958, he started working with the glass factory Gino Cenedese (then Ars Cenedese Murano). The presence of Mr. Da Ros remained a permanent feature in the glass factory Cenedese, always working in close co-operation with the glass master craftsmen. Under his art direction, the factory developed various decorative lines of contemporary design, always at the highest standard. First, with the stylised forms with submersion of colored glass; in more recent years, with the technique of ‘scavo’ glass (a particular finish of the glass, looking like glass brought to light from archaeological excavations) an important decorative line was introduced in various new creations, all of which of great appeal for the simplicity of the lines, the preciousness of the material and the modernity of the colors. 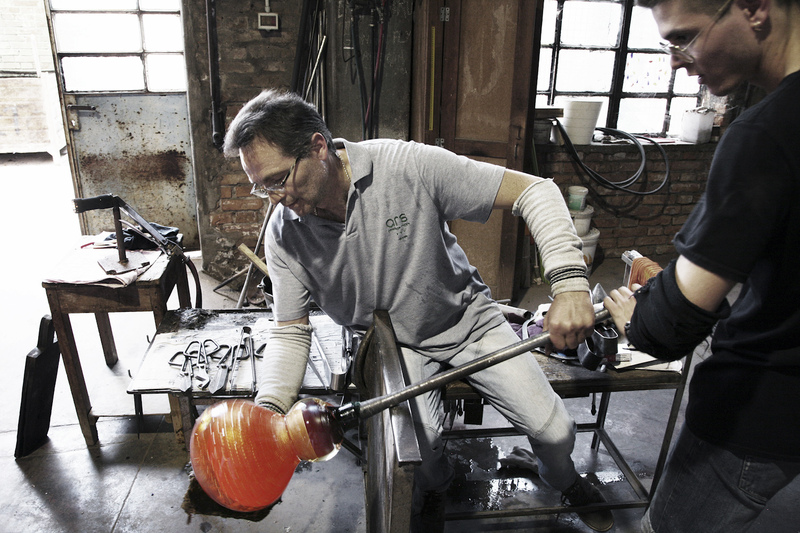 His last works were a return to the traditional Murano techniques of hand-blown glass, but re-interpreted with a contemporary sensibility; such as the ‘Venice dreams’ collection, as well as ‘Venezia I’ and ‘Venezia II’ collections. Maestro Ermanno Nason was born in Murano in 1928 from one of the oldest families in Murano; the first records of the family Nason name dates back to 1300. Mr. Nason started working at his father’s glass factory when he was 9 years old; he always said that the only way to learn effectively the art of glass making is to start at a very young age, watching closely and working next to great Masters of greater skills. After primary school, Mr. Nason attended the Drawing School for glass making apprentices, where he studied with Professor Vittorio Zecchin and Professor Luigi Scarpa Croce, dividing his time between classes and work in the furnace. In 1952 he was promoted ‘Maestro di prima piazza’ (i.e. leading Master in the glass furnace, the equivalent of a “first violin” in the music field).In 1953 a revolution took place in the world of glass: a number of celebrated artists – such as Chagall, Cocteau, Borsi, Picasso, Arnoldi, Arp, Guttuso, Klee, Kokoscha, Saetti, Max Ernst, Le Corbusier, Fontana, Minguzzi, Underwasser, Brindisi, etc. – draw some designs to be made out of glass, and Maestro Ermanno Nason was one of the greatest executors. Mr. Nason distinguished himself from the other craftsmen by his impeccable elegance of dress and manner, and most of all by his ability to create shapes and volumes without a single moment of hesitation – working without having to correct his error for, practically speaking, he rarely committed one. He specialized in the glass making technique called a massello, in which a block of glassy mass is stretched, shaped and fused, allowing multiple pieces to be joined without seams. From 1965 to 1972, Mr. Nason worked for the Gino Cenedese glass factory creating some original pieces of his own design, as well as executing designs of Professor Antonio Da Ros (Cenedese‘s resident designer) and other famous artists – such as Harold Stevenson and Silvestri. At Cenedese he was allowed to abandon routine production and work freely, innovating as he pleased; some pieces are bold and abstract, works no longer subject to judgement or expectations by others. Mr. Nason continued working in the furnace until 1993; his masterpieces are exhibited in museums all over the world, or are part of private collections. Maestro Ermanno Nason died in Jaunary 2013. Napoleone Martinuzzi (1892-1977) was an Italian sculptor and glass designer. Son of a famous Venetian glass master, between 1906 and 1909 he attends the school of Antonio Dal Zotto, at the Accademia delle Belle Arti of Venice. His first exhibition is at Ca’ Pesaro in Venice in 1908. From 1910 to 1911 he lives and works in Rome in the study of Angelo Zannelli. In 1914 he exhibits in Rome a white-marble sculpture at the Second Roman Secession exhibition. From then on he will display his works, mainly white marble and bronze sculptures, in the most important Italian and European exhibitions (Biennale di Venezia, Quadriennale di Roma and also in Paris, Bruxelles and Vienna). In 1917 he will start a co-operation with the famous poet and writer Gabriele D’Annunzio with whom he will design and realize famous sculptures such as “La Canefora”, “La Vittoria Alata” and “La Testa di Michelangelo” that can be seen at the Vittoriale in Rome along with many beautiful glass objects. From 1922 to 1931 he is the director of the Murano Glass Museum and in 1925 he will become partner and art director of the Venini glass factory. The collaboration with Venini results in a major breakthrough in glass design and techniques. 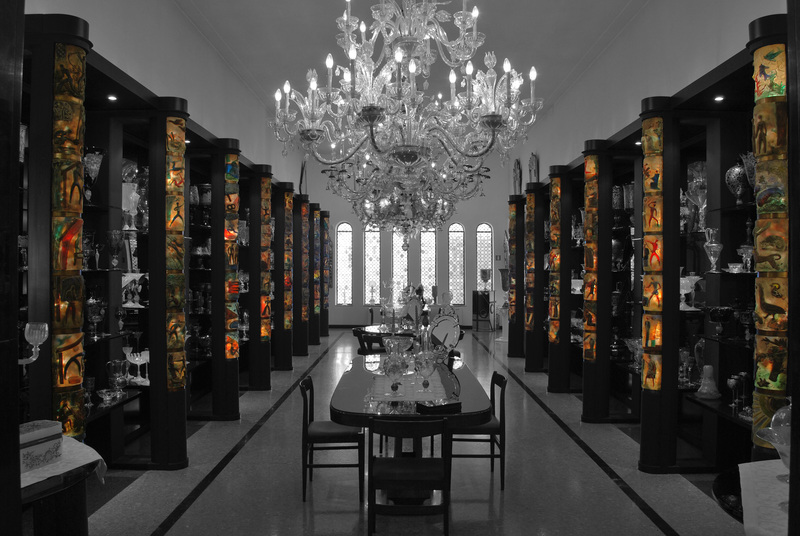 In 1932 together with Francesco Zecchin he establishes a new glass factory and exhibits at the Triennale di Milano. After a period of transition in which he dedicates himself mainly to sculpturing, in 1947 and for five years he is art director for the Arte Vetro glass factory of Alberto Seguso and realizes glass sculptures of female torsos and heads. From 1953 to 1958 he co-operates with the Gino Cenedese glass factory realizing chandeliers, sculptures and bassorilievo glass panels in excavation style glass that can still be admired in the showrooms of Ars Cenedese Murano. The master decorator Giancarlo Begotti, born in Venice on December 5th, 1920, is reputed to be one of the greatest artists of the latest generations, for the hand-made decoration on the art glass works of Murano craftmen . Since approx. 50 years, he has operated in this field. Graduated from the Superior Institute of Decorative Arts ‘Carmini’ of Venice; he moved his first steps in the field of publicity design; and then, after the second world war , he became attracted by Murano glass and by the great possibilities and challenges in the decoration of this precious material.He has remained to work in the island of Murano; and an important period for his career have been the years spent at Cenedese’s, in close co-operation with the glass masters. These have been the years 60’s 70’s and early 80’s.Particularly, he has dedicated to the decoration with pure gold, called ‘GRAFFITO’ , and with coloured vitreous enamels; reviving the ancient techniques of the glorious Venetian Renaissance. For the subjects, he has inspired from the Venetian painters of ‘600 and ‘700 centuries; and also his own subjects, always from Venetian themes (ladies – knights – and ‘campiello’ scenes). His works have been exhibited in many Expositions in Europe – the most recent one in Lugano (Switzerland). Some of his works can be found in the private collections of some of the most important people in the world; such as the former president of China Hua Guoh Feng – the former president of the U.S.A., Jimmy Carter (a glass globe ‘Mappamondo’, made by Cenedese and painted in gold Graffito’ by Begotti, is kept in the White House Museum – Washington, D.C.). Maestro Maurizio Asti was born in 1962 in Murano, where at present he works for the Ars Cenedese glass factory. 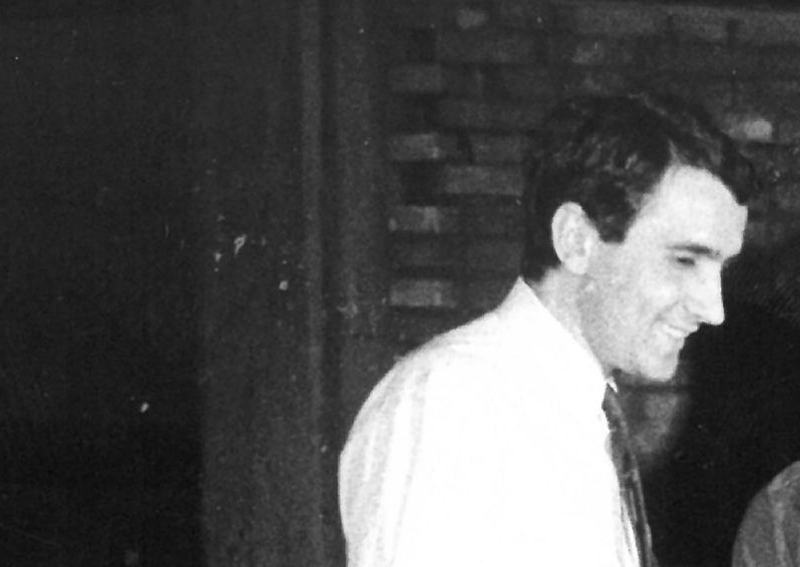 Maestro Asti joined Cenedese in 1977 at the age of 15, starting as an apprentice next to the great maestro Fabio Tosi. Working with Maestro Tosi he has developed his skills and brought the ideas of Maestro Tosi to an even higher level. He has become a master in the Sommerso (overlay) technique in which he achieves the effect of colour suspended in to light by first applying a coloured overlay to a crystal core and then casing the piece in crystal, separating a sequence of overlays that appear to be floating inside. He has also developed new ideas in glass sculpturing and his realisations of abstract forms in the overlay technique are simply breathtaking. Maestro Asti is also continuing the work of Maestro Fabio Tosi in reproducing and manufacturing some traditional roman pieces and other modern pieces using the ‘Excavation’ technique, which by applying different kinds of minerals to the melting glass gives the objects a dull finish that capture nature’s own process of oxidation. Master decorator Elena Bucella was born in Venice on October 1st, 1959. Since she was a child, she has always loved art and chosen to express herself though paintings and drawings.Just after finishing the mandatory school in 1976, she applied to join the Ars Cenedese Murano glass factory, where she knew an excellent art department still carried on the antique tradition of glass decoration.As customary for young pupils, she started working as an apprentice and trainee in the workshop. Young and talented, she soon displayed an exquisite skill and was taken under the protective wing of Mr. Guido Dorigo, then the chief decorator at Ars Cenedese Murano. 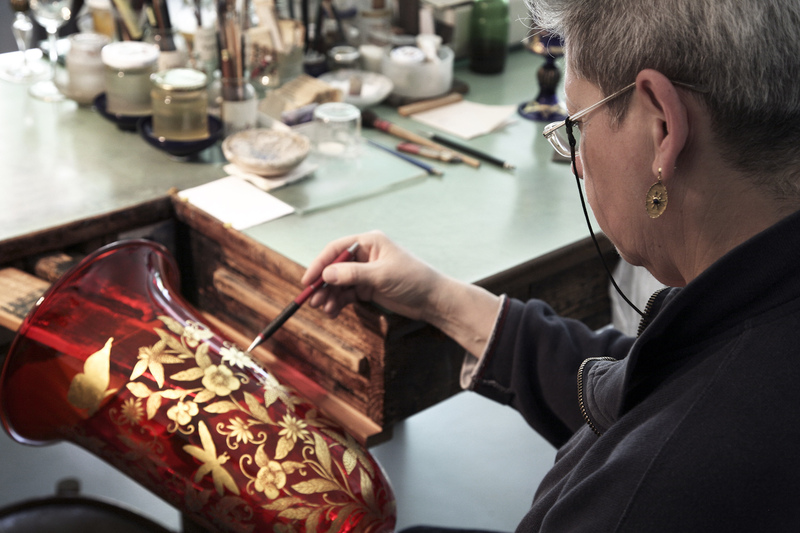 Under his guidance she learned the trade and perfected her skills, excelling in the various aspects of glass decoration and eventually becoming the chief decorator at Ars Cenedese Murano after Mr. Dorigo’s retirement. 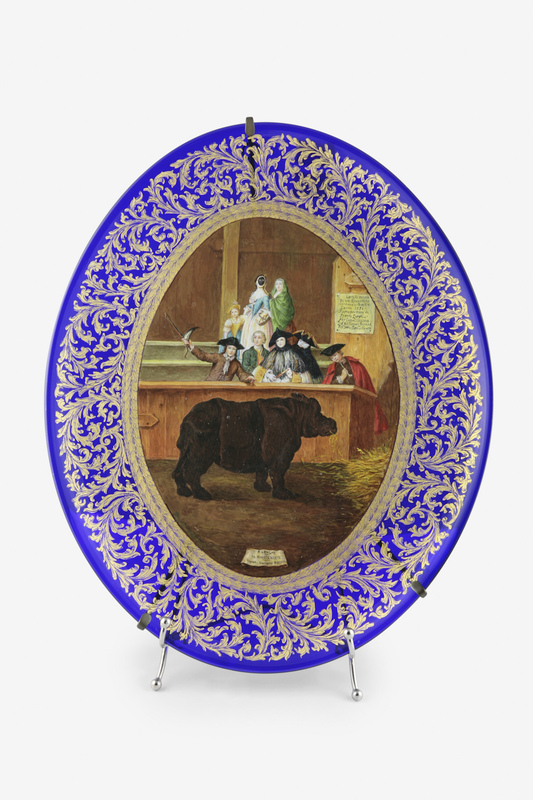 Among her works are worth mentioning the glass Earth globe with gold graffito decoration, the reproduction of the Barovier wedding cup, several plates with reproductions of famous paintings, as well as beautiful sets of drinking glasses depicting scenes of 18th century Venetian life, using both the gold graffito and the colored enamels tecniques.